Dr. Harini Priya M completed her BDS (Bachelor of Dental Surgery) from Bapuji Dental College and Hospital, Davanagere. In 2004 and MDS (Master of Dental Surgery) in Pedodontics and Preventive Dentistry from Yenepoya Dental College Hospital, Mangalore, India in 2008. Dr. Harini was awarded 'Gold Medal' in university for securing 1st rank in MDS examination (Pedodontics and Preventive Dentistry) in 2008. She has published severe research papers in international and national journals. She has also presented and attended various conferences. She has won 'Best Paper Award' for her presentation on “Probiotics in Oral Health'. 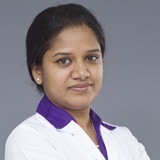 Dr. Harini Priya practices all procedure related to children's dentistry including tooth coloured and other fillings, extraction, space maintenance, early and interceptive orthodontics, root canal therapy and other various pulp therapy procedure etc. She is also very experienced in performing full mouth rehabilitation under under general anaesthesia for reluctant children. Her special areas of interests are management of traumatic injuries in children and regenerative endodontics. Dr. Harini Priya is well versed English, Hindi, Tamil, Malayalam, Kannada, Urdu & Telugu. Language Known : English, Hindi, Tamil, Malayalam, Kannada, Urdu & Telugu.